ABOUT THE SEAT With 44 seats arranged in a 2-2-2 configuration, premium economy on any airline has never looked so cool! At first glance, the “Spaceseat” looks more like a watered-down business class product, rather than an upgraded economy seat – and boy does it feel like one too. The generous use of light-coloured leather only adds to the luxurious cabin feel. Sporting bigger seat width and pitch than most competitors, ANZ’s premium economy product ranks among the top in its class. ABOUT THE SERVICE Inflight dining on ANZ is known to be top-notch and premium economy is no exception! Choose from an extensive selection of premium wines, compiled by top Kiwi sommeliers. Other perks include priority baggage, amenity kits and a bottle of water at your seat. Premium economy on ANZ isn’t just a comfortable experience; it’s a premium one, too. ABOUT THE SEAT Lufthansa’s our new proud mama in the skies. 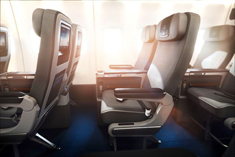 Having unveiled the new premium cabin only a few months ago, Lufthansa is set on phasing its new travel class in from September. After receiving positive initial feedback and promising future bookings, the German flag carrier’s recently decided to speed up the inauguration process and have premium economy fitted on all of its long-haul aircraft rather than just its flagship B747-8. Depending on the aircraft, the seats will be up to three centimetres wider and offer approximately ten centimetres more room at the sides aided by extra-wide armrests and centre consoles. Personal TVs are a generous 11-12 inches with improved audio-visual on-demand offering. ABOUT THE SERVICE Lufthansa’s premium economy passengers can check up to two bags in (23kg each) and have access to the airline’s business class lounges – albeit for an extra cost of EUR25. In terms of catering, the mains are the same as in business and served on porcelain and glassware. ABOUT THE SEAT TK’s Comfort Class beats them all in terms of seat pitch. When have you actually heard of a premium economy product offering 46 inches in seat pitch? Oh right, you haven’t! I always like to tell people that TK’s Comfort Class is somewhere inbetween Cathay Pacific’s old and new regional business class. Seat pitch and width definitely compare, the entertainment not so much, but it’s good enough and will easily keep you entertained for ten hours or so. The seat sports a generous dining table, which doubles as a work desk, as well as a footrest. ABOUT THE SERVICE Well, we’ve heard it all before, haven’t we? Turkish Airlines is horrible, ought to be avoided and customer focus is non-existent. Fine. I take all that and do not want to defend the airline too much, but we’ve got to give credit where credit’s due. And TK’s Comfort Class is simply an outstanding product that’s also priced very competitively. Food’s served on porcelain, amenity kits are the same as the airlines’ mid-range business class ones, and you bag 125 per cent of the mileage. ABOUT THE SEAT When an airline hires a high-calibre designer like Marc Newson to develop its premium economy seat, it’s practically a guarantee that a quality product will be produced – one that provides excellent comfort via ergonomic design. This is evident in the seat’s optimised legroom, supported by a footrest that extends from the seat. A 10.6-inch personal, touch-enabled screen is a fair improvement over the 8.38-inch model seen in economy. ABOUT THE SERVICE Premium economy usually gets good, solid Aussie service. Dining is typically of the highest quality, courtesy of Neil Perry Rockpool inspired menus – all of which are served on stylish Marc Newson-designed tableware. All this is complemented with a selection of premium Australian red, white and bubbles. ABOUT THE SEAT With extended seat pitch and slide, JAL’s Sky Premium seat is a significant improvement over the airline’s old Sky Shell seat. The 12.1-inch touch panel monitor is one of the biggest in this class, and the legrest and 3-step adjustable footrest ensures maximum comfort over longer journeys. However, it’s the little things that make this seat special: In addition to centre dividers for added privacy, we particularly appreciated the dual, yes, you’ve heard right, dual plastic bottle holders. ABOUT THE SERVICE Sample some of JAL’s premium beverage choices when travelling on premium economy, including Japanese Shochu “Tomi-no-Hozan” – made from carefully selected “Krogane Sengan” sweet potatoes, and Gardet Brut Traditional N.V. champagne. In addition, JAL goes a long way to ensure that your flight is a comfortable one. Which other carrier provides portable air massagers or green bamboo sticks to massage the soles of your feet? All that glistens is not gold – Garuda Indonesia in trouble?